I have ever tried doing my dating life without Christ. I simply did my choosing, my way, in my timing and worked so hard for an approval. Christ was blurred, a vague vision, somewhere in the corner of my heart when it came to the stage of dating and courtship. My identity was pegged largely on my status. SINGLENESS was not good for me. If I was single, then it meant that I was lesser on the hierarchy of belonging. 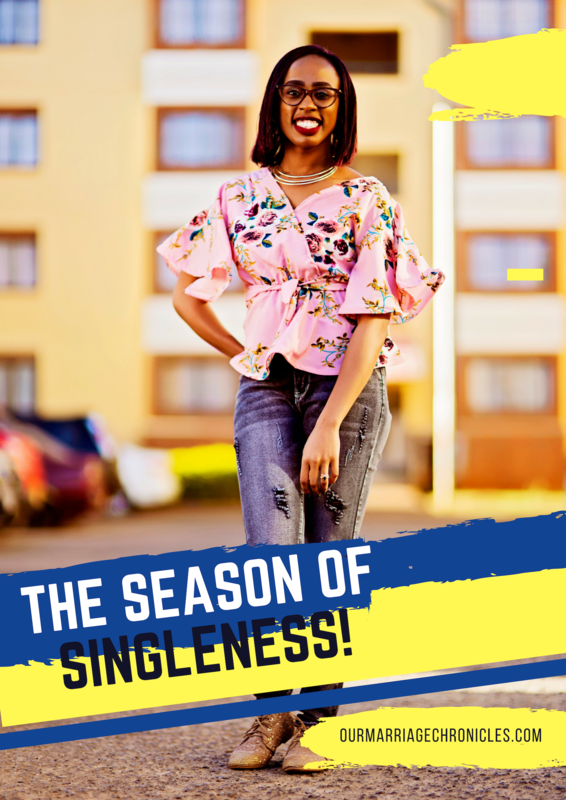 It meant that I wasn’t beautiful enough, funny enough, great enough, amazing enough, I was less – less was all I could here.Singleness was a euphemism for a tragic loneliness. So I worked hard not to be alone. I held on even when the state seemed helpless, untenable, dead. I held on onto relationship corpses, at least I felt not alone. On a mortal man my identity hung, and any aorta of discontentment shown towards me would literally grind my being to a halt. I struggled alone, I fought with God. No one knew how deep the vortex in me save for Christ himself. I wore a big smile, had a hearty laugh but beneath it lay raw wounds. Wounds afflicted by what essentially breathed life into this very soul, what costed Him His life, Love. Could God have short changed me? Was singleness this tragic? Why did it feel so bad to be single? What I failed to realize that sanctification was essentially the knowledge of Christ’s perfection to be enough strength for my weaknesses and pain. I needed His love so sufficiently to love my brokenness. I needed to see myself through His eyes. I needed Him to cover my nakedness, to redeem my fallen countenance, I needed Christ to be my first love, the only love, that all other things would echo who is already to me. I defined myself as a single Christian rather than a Christian who happens to be single. The mindset on which i pegged my identity on was damaging. Tragically, I, like many singles out there, dismissed the first part. Life has no biggest tragedy like our God ignored. It was until I unclenched my hard fists. Gave my heart back to Him wholly. Surrendered every ailing part of me, especially my broken heart. Yielded the control I held onto, to Him. He was not any less good to me than that monumental Friday He bleed on the cross for me and had His head covered by thorns that bleed His tender scalp out. He hadn’t shortchanged me. I had created a god called man for myself. I wanted to be loved, but my pursuit was a million miles in a different direction. It was until I gave Him back His throne. He sat on the throne, I bowed at His throne. He lifted my gaze. He gave me a new name. I was His before becoming any man’s wife. I belonged to Him, vowed to Him, before vowing to any other man. He was my covenantal love, before covenanting to any other relationship. We are chronic amnesiacs. We forget that we belong our Lord before anything else. We rush into relationships to justify our living instead of living out for Him first, celebrating every season he sets before us. My identity was in HIM, not a relationship. I am defined by His love for me, His redemption, Him, Christ in me. I surrendered to His unknown will. Not sure where it would take me but I surrendered. Not sure of what lay before me, but I gave it all. His love filled me, overwhelmed my soul, turned me inside out, flooded my heart. I drowned not, but I was re-made. Previous Post30 DAYS OF GRATITUDE: DAY 27: BUILD WITH HIM. Next PostREMEMBER THE LORD WHILE YOU STILL HAVE TIME.